Bastia striker Brandao has been banned for six months by the French football league for headbutting Paris St-Germain's Thiago Motta last month. Brazil-born Italy midfielder Motta broke his nose in the incident. The pair had clashed during PSG's 2-0 Ligue 1 victory over Bastia and Brandao appeared to wait for his opponent in the tunnel after the game. Brazilian Brandao, 34, who had been provisionally suspended since 22 August, is banned until 22 February. 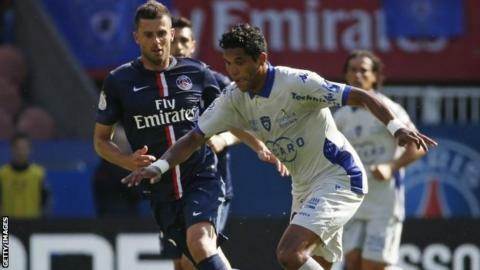 After the incident, PSG president Nasser Al-Khelaifi called for Brandao - who only joined Bastia in August - to be banned for life, saying: "He is not a football player." Brandao previously had spells with Saint-Etienne and Marseille, where he won the French league and two League Cups, before joining Bastia.